In February, the month that patients with rare diseases call it rare month, we will try to educate about 28 different rare diseases. The statistical data about rare diseases in Macedonia is not yet official as the registry is a work in progress. We estimate that there are over 2000 patients that face life with a rare disease in Macedonia with over 100 different diagnoses. 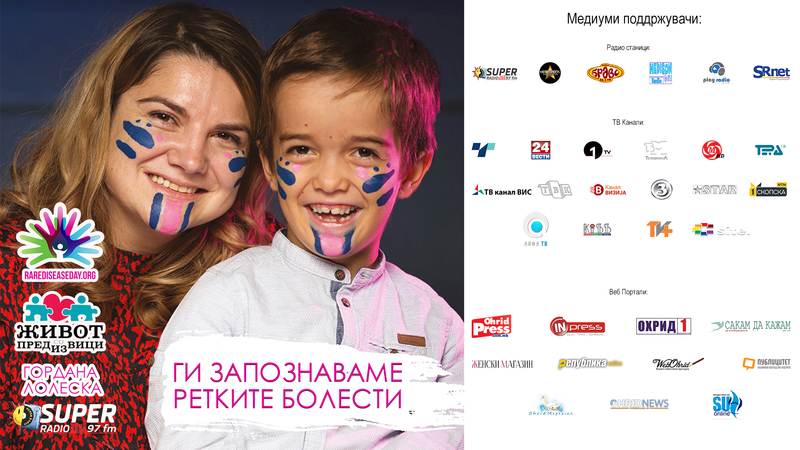 This is why Super Radio, Gordana Loleska and LIFE WITH CHALLENGES this February will share information about rare diseases in R. Macedonia. This is just hoping to learn more and be informed. First time, Rare disease day was marked in 2008 on 29th of February. Now every year, the last day of February is Rare disease day. Rare disease day is international campaign for raising awareness on rare disease. From 2008 until today, thousands of events are happening all around the world. It began as a EU event and now it is global, 90 countries from all over the world marked this day in 2018. R, Macedonia for the first time, marked this day with an event in 2012. The campaign for RDD is for the public, for the institutions, the patients, the organizations, the medical professionals, the researchers, the students .. everyone is welcome to join in …the more the better. RDD is a possibility for the participants to be a part of the global call towards the policy makers, the researchers, the pharmaceutical companies, the medical professionals so that patients will be more involved in the research on rare diseases. This years the theme of the events is – Connecting Health and Social services. Also we are continuing with the campaign #ShowYourRare for the social media. People from all over the world are painting their faces showing how rare they are for Rare Disease Day.